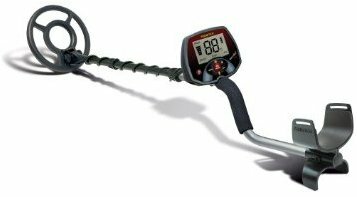 Teknetics Alpha 2000 is a proud descendent of the Teknetics Family of Metal Detectors. 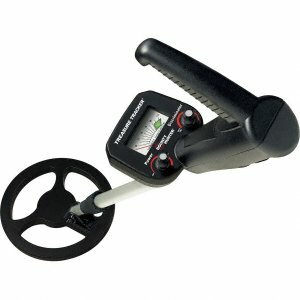 This unit comes with 3 Tones of Discrimination, 2 Search Modes, Preset Ground Balance and an 8 Inch Open-Face Coil System. Transmit Frequency: 7.8kHz. 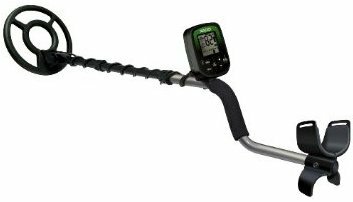 The Teknetics Delta metal detector makes professional-level treasure hunting available for everyone from novices to pros. Sophisticated yet user-friendly, the Delta is ideal for coin shooting, relic hunting, and gold prospecting, even in crowded or trashy areas. Great Depth 99 points of discrimination 3 audio target tones 0-10 Volume control Headphone jack (with cover protected at PRO) Pinpoint 10 points of sensitivity 9V battery Visual ID target system Very low weigh and best balance in the class! 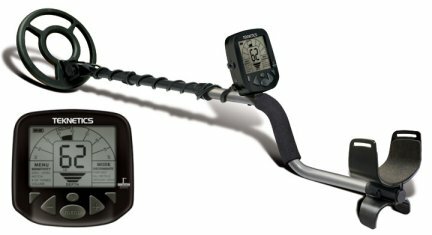 5 Year Warranty The Eurotek has many unique features you won't see anywhere else at any price. Features that make the Eurotek ideal for hunting in iron infested locations. Iron LED Indicator- The IRON ID icon is a non-audio indicator and will light any time the machine goes over iron REGARDLESS of where the Discrimination is set. 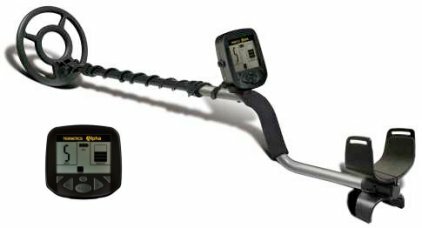 Separate and Independent Iron Target volume Control- Allows the user to adjust the volume of iron targets separate from other targets. This is an industry first never before done on any machine at any price! Being able to set the volume of iron lower than the other targets makes much easier to "hear" the good targets in Iron infest grounds. Expanded Iron range, 39 segments of resolution, allows control and better ID of iron targets 3-Tone audio ID with V-break. Low iron tone, VCO mid-range, Hi Tone. Also variable audio between 70-79 ID range depending on Disc setting. Headphone jack Door. Keeps debris out when not in use. Removable center rod for easy use on vertical surfaces or for youth and smaller users. Here are a couple of features that make the Eurotek suited well for hunting in Europe: The Eurotek Pro uses Target ID numbers and not target categories making the Eurotek Pro universally simple to read and ID targets. In Pinpoint Mode the Eurotek shows depth in Inches or Centimeters (very unique!). Easy to change and save. All-Pro 3 Qt. 1/4" Sifting Scoop from Wilcox works great as a treasure scoop. 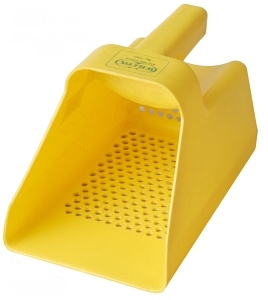 This scoop will not corrode and is easy to clean. Yellow plastic. 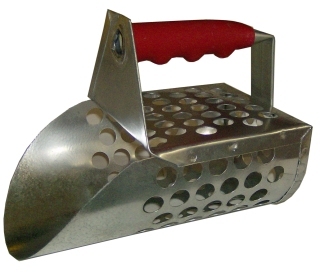 Perforation Holes: Bottom: 195 - 1/4 diameter holes Back Side: 76 - 1/4 diameter holes. 6" width. Weight apprx 8 Oz.